Some weather gurus are saying this week is winter's last hurrah. Well, we'll see about that. I'm not going to be putting away my mittens and boot grippers just yet. In fact, I have put down money that we won't see bare ground in our back yard for at least three more weeks. 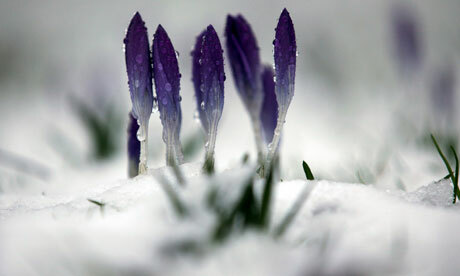 While we're all waiting for the crocuses to dare show themselves, there are quite a few books we can curl up with. May 7 will be the 100th anniversary of Germany's torpedoing of Cunard's luxury cruiser Lusitania, with the loss of 1,200 of the nearly 2,000 passengers and crew onboard. Lusitania was sailing from New York to its home port of Liverpool, and was just a few miles offshore of Ireland, expecting to reach home port later that afternoon, when a German U-boat blasted it just under the wheelhouse. The ship listed so badly and sank so quickly that only a few lifeboats were launched. As with Titanic, most victims drowned or died of hypothermia. Many of those who survived were rescued by Irish volunteers who sailed to help as soon as they heard of the calamity. Mysteriously, HMS Juno, a British cruiser, set off from Cork, but then turned around. So why did the Germans fire on a luxury passenger ship? They had warned that all shipping passages in the British Isles were war zones, and this warning was printed in newspapers. In response to the outraged responses to the sinking and loss of civilian life, Germany pointed to the fact that the ship was carrying munitions, which was true. Though the US didn't enter World War I for two more years, the sinking of Lusitania and the loss of most of the 139 Americans onboard increased agitation for American involvement, both from Europe and within the US. 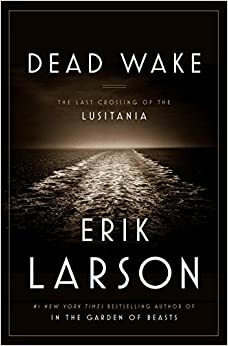 We have less than a week to wait until Erik Larson's Dead Wake (Crown, March 10) arrives to recount the story of Lusitania. The publisher's blurb says that we may think we know the story, but we really don't, and that Larson's book is filled with glamor, mystery, suspense and evocative characters. I take blurbs with a grain of salt, but this is Erik Larson, after all, the man who has given us spellbinders like In the Garden of Beasts, The Devil in the White City, Thunderstruck and Isaac's Storm. I pre-ordered Dead Wake months ago and I'll be haunting my mailbox next week until it arrives. 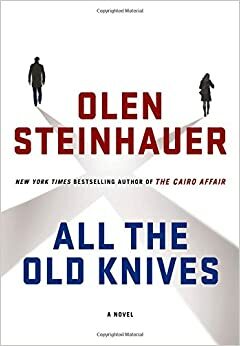 Speaking of mystery, suspense and evocative characters (but not so much glamor), March 10 will also see the publication of Olen Steinhauer's new novel, All the Old Knives (Minotaur). I had the opportunity to read an advance review copy of this one, and it's an unusual, but gripping espionage thriller, with nearly all the action taking place in one evening, in a restaurant. Henry and Celia were lovers and fellow CIA agents in Vienna when a terrorist hijacking went very wrong on the tarmac at the city's airport, after a low-level CIA agent who happened to be on the plane had his identity discovered by the terrorists. Was the agent betrayed and, if so, how? After that terrible tragedy, Celia left her old life, married, moved to the paradise of Carmel, California, and became a stay-at-home mother to two kids. Now, Henry calls to say that he's in the area for a conference and would love to get together for dinner. Who knows what may lurk behind the doors of these quaint Carmel eateries? The story is told in the alternating voices of Henry and Celia. Is one of them an unreliable narrator? Are both of them? This is a quick read, but completely engrossing. I was gripping the book so hard I left indentations. When I reached the end, nearly everything Henry and Celia said now appeared in a different light. I've read all but one of Olen Steinhauer's many espionage novels, and I'm a big fan. In this case, I was impressed that he went in a different direction with his plotting and that it was a success. In the book, he says he wrote the story in a very short time, inspired by having seen The Song of Lunch, a televised adaptation of Christopher Reid's poem, which stars Alan Rickman and Emma Thompson as former lovers who meet for lunch in a London restaurant, 15 years after the end of their affair. If you saw that production, you might be particularly interested in reading All the Old Knives. Do you remember that old line, "If you can remember the '60s, you weren't really there"? I was in high school during the Summer of Love and in college during the ferment of the early to mid-'70s, and I thought I remembered those times. 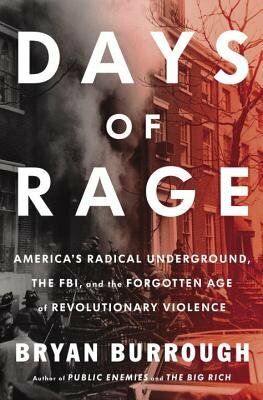 But now I'm reading an advance review copy of Bryan Burrough's Days of Rage: America's Radical Underground, the FBI, and the Forgotten Age of Revolutionary Violence (Penguin Press, April 7), and I'm seeing I was wrong, in a big way. Sure, I remember when the Weather Underground accidentally blew up one of their members' family's townhouse in Manhattan; the Kent State shootings; the massive bombing of the University of Wisconsin building; Patty Heart's kidnapping, apparent conversion to a cadre in the Symbionese Liberation Army, the live televised shootout and inferno of the SLA hideout in Los Angeles and Patty going on the run for over a year until her eventual capture in San Francisco. I remember that the national news every night during that period seemed like a nonstop cycle of updates about the Vietnam War, the Civil Rights movement and the student protest movement. But I either never knew or plain forgot about just how much shooting, bombing, kidnapping and other violent actions were associated with the various self-styled revolutionary groups. Burrough writes that in 1970, 330 bombs were set off by our own citizens. Usually, the bombers timed the devices to explode after hours and phoned in warnings, so it was rare to have fatalities or even injuries. Still, we're talking about bombs going off and causing serious damage in buildings like the New York Police Department's headquarters, major Manhattan banks, the National Guard building in Washington, DC, the Marin County (CA) courthouse, the Presidio Army base in San Francisco, even the US Capitol and the Pentagon, and many more important sites. Just imagine if that happened today! I'm finding this a fascinating read, and it will have me reflecting for a long time about those times, where we are today, and what accounts for the differences in who now engages in violent political action and how we respond. I've written here so many times about Philip Kerr's Bernie Gunther series. As soon as I finish one book, I start looking out for the next one. As far as I'm concerned, he can't write them fast enough. I won't have long to wait for his new one, The Lady From Zagreb (G. P. Putnam's Sons, April 7). This is the 10th book in the series, but if you're a regular reader, you know Kerr has jumped around a lot in time. The good news is that means reading the series in order isn't all that critical. This book is set in 1942 and 1943. Bernie is a criminal investigator for the Nazi SD, and his first case in this story is to find out who beat an attorney to death in his office––with a bust of Hitler. Bernie already has a connection with the victim, who had asked him to provide information about the attorney's suspicion that a charitable foundation was a fraud. A year later, with no solution to the lawyer's murder, a new case is pressed on Bernie. He's asked by Minister of Propaganda Josef Goebbels (whom Bernie refers to––not to his face, of course––as Mahatma Propagandhi or, more often, Joey the Crip) to help a film starlet named Dalia Dresner track down her missing father. Goebbels, a famously unattractive but powerful and oversexed man, was known for pursuing actresses, so I'm going to guess he won't be happy when Bernie falls for Dalia. Dalia's case takes Bernie to Yugoslavia, where the Nazis had teamed up with the ultra-nationalist and repressive Croatian group called the Ustashe. The Ustashe actions may not be as well known as some of the others in World War II, especially by those in the so-called bloodlands, but they were every bit as chillingly brutal and genocidal. Bernie will witness yet more of the atrocities of his own people and their allies. 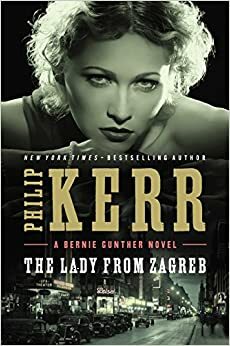 Kerr makes Bernie Gunther a sort of wisecracking German Sam Spade, and combines classic hardboiled plot lines with serious issues of how a decent guy––but no angel––gets by in Nazi Germany. Publishers Weekly says this one's superlative, so I'm even more anxious than usual to read what fresh hell Bernie Gunther's gotten into. Here's another bit of trivia I learned recently. Philip Kerr is married to journalist Jane Thynne, who is also a novelist. She has a series featuring a British/German actress named Clara Vine, who is trying to become a film star in Germany in the 1930s and gets mixed up with powerful Nazis. I just got the first book in the series, Black Roses, and I'm looking forward to seeing how Thynne's Clara Vine deals with the people and events that Bernie Gunther comes up against in his series. You know how our seasonal preview posts are supposed to be about the books we're most looking forward to reading? Well, there is this one book that I know I have to read, but I susupect I'll hate myself afterward. It's Andrew Morton's 17 Carnations: The Royals, the Nazis and the Biggest Cover-Up in History (Grand Central, March 10). I mean, first of all, what an embarrassingly over-the-top title! Second, the author is Andrew Morton, an English writer of celebrity biographies. He's written about Princess Diana, Prince William and Kate Middleton, Tom Cruise, Madonna, Monica Lewinsky, and Angelina Jolie. Some of his books have sold well, but many have been heavily criticized, especially the Angelina Jolie bio. So why will I read this book? You know I can't resist a story about how the former Edward VIII, who famously abdicated the British throne to marry Wallis Warfield Simpson, supposedly conspired with the Nazis to be re-installed as the British monarch once Germany invaded Britain. Documentary evidence ostensibly existed, but a secret operation was launched to recover and destroy it, to preserve the monarchy. I am very dubious about the story (to say the least) and I would bet serious money that Morton will focus on all the most salacious stories about Simpson. The title alone tells me that. The "17 Carnations" part is a shorthand reference to a bit of scurrilous and never-verified gossip that Wallis Warfield Simpson had an affair with Nazi Germany's Ambassador to Britain, Joachim von Ribbentrop, and that he gave her 17 carnations to memorialize each time they slept together. I haven't read anything really trashy in awhile; maybe that's also part of why I'm attracted to this in spite of myself. So here's the deal: I'll read it so you don't have to. Note: Thanks to the publishers for providing advance review copies of Olen Steinhauer's All the Old Knives and Bryan Burrough's Days of Rage. Some of my description of Olen Steinhauer's All the Old Knives is taken from the review I posted on Amazon under my username there.